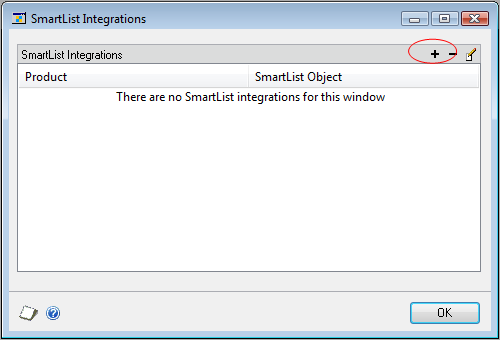 Click Save on the Add/Edit SmartList Integration window, OK on the SmartList Integrations window and Save on the Extender Windows window to finish. 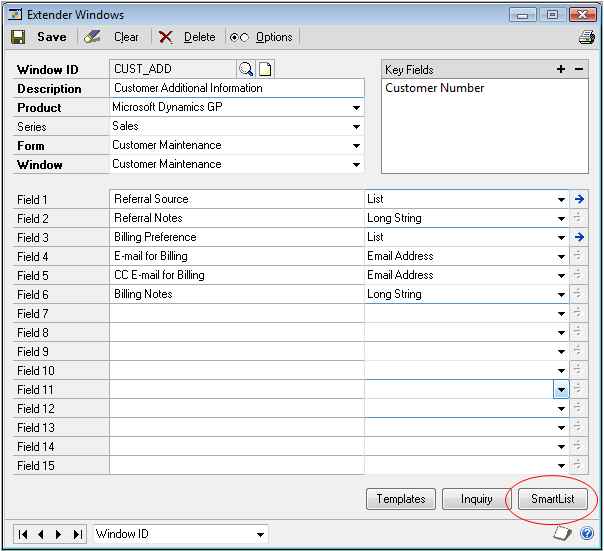 In this example I started by creating a brand new Extender window, however, you can easily go to any existing Extender window and add it to SmartLists following the steps above. 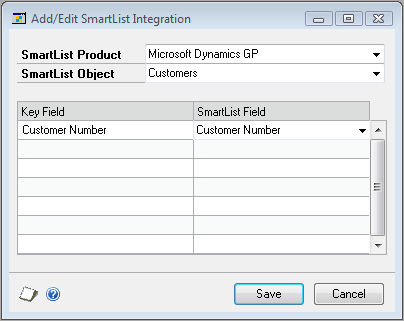 I added Extender data to the GL transaction entry screen but don’t see how to add this to an existing smartlist – can you give any guidance? I don’t see the Account Transactions SmartList as an option to add anything to. Is that what you’re trying to do? In this case, you may need to create a custom SmartList. Your step by step process mentioned above has aided me in incorporating my extender field in SmartList, and for that I thank you, however I am not able to get the extender field in my SLB to create a calculated field. Could you please advise me on this process as well. Using this method you would not be able to add anything other than existing fields to existing SmartLists. For just about anything else, I typically recommend creating your own SQL view with all your data and calculations, then using SmartList Builder to create a new SmartList based on that view. Thank you Victoria, I will go ahead and try that. We ran a SQL Profiler and noticed that, for one returned row (e.g. 1 vendor), the Smartlist makes 84 SQL calls with two Extender fields and “only” 8 without the Extender fields. This explains the poor performance however, I wonder if this is nornal? Are Smartlists Integrations always that slow? 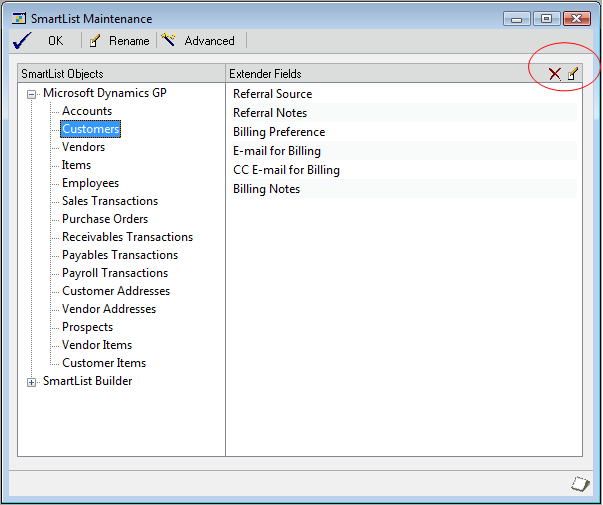 We can use Smartlist Builder to create a new Smartlist and join the SQL view but we would prefer to use the existing one. I just did a quick test and I definitely see the slowdown once I add Extender fields to a SmartList. I didn’t time it – with the data in the sample company it was noticeable, but not terribly significant. However, there are only 102 vendors there and I only added a few columns of data. I imagine that this would be more noticeable with more data. Without any specific knowledge of this, I would guess that because of what has to be done to accomplish adding fields to SmartLists ‘on the fly’ like this, the code has to be very generic and thus inefficient. 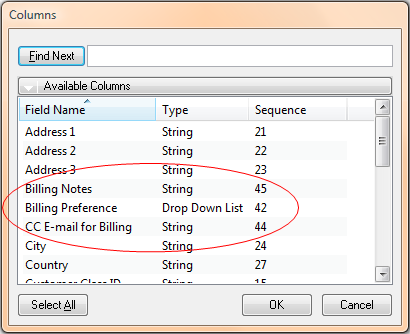 Similar to coding SELECT * instead of specifying only the fields you need. Again, this is only a guess. I typically prefer to create custom SmartLists for Extender data myself. Even though it’s a bit of a pain to code Extender data, it is usually well worth it in the end for the performance as well as flexibility. Thank you for following up. No, I haven’t talked to GP support yet or asked the forums. I did some searches though, but they have been unsuccessful. Too bad that I only had the issue just after coming back from Convergence… There was plenty of GP support on spot! We have about 3250 vendors which could make the slowdown appear even worst but you are probably right, the implementation must be very generic and inefficient. I will ask the forums and see… In the meantime I will follow your advice and create custom SmartLists for Extender! P.S. Your site is very well done and organized, I like it very much. Your contribution to the GP community is also very significant and appreciated by all, including the other MVPs. Thanks for that. I created a window to add more details to the manufacturing order entry window. I know that you dont deal with manufacturing, but applying the same technique above, when I was adding smartlist integration, switch the smartlist product to manufacturing, but there are no smartlist objects listed in the second combo. So my question is how can I add a smartlist object ? There is a limited list of SmartLists that this is possible for. It may just be that no manufacturing SmartLists are available for this. I would recommend posting your question on the GP Community forum to see if you can get some more feedback on this specific to manufacturing. Is there a limit to the number of Extender fields you can add to a SmartList or SmartList Builder Object before the Field Type shows as “Not Defined”? I have used Extender and SLB quite a bit and have tried all the troubleshooting advice from the KB article and your article as well, but it seems that only the first several hundred fields (I will have to count exactly how many) when added to Smartlists work fine no matter which Extender windows they come from and the rest show up as “not defined”. Any thoughts or suggestions? I have never run into this before, but I can’t say that I routinely add several hundred Extender fields to a SmartList, either. How exactly are you adding them? And in what version/build of GP? So the 77th field changes to “Not Defined”? Seems kind of an arbitrary number. I have not heard of this as a bug, but have you checked with Microsoft on this? Sorry I cannot offer any more information on this. It may be that this is a limitation and your only option for this would be to use SmartList Builder and create a SQL view with the data you want to show. Regarding Extender security, would anyone know how to grant access (GP2010) to a print option within an Extender window? We have an extender window enabled for our Project Accounting module and in the lower-left-corner of the extender window is a printer icon. When I click on the printer icon the desired report is produced (but then I’m the admin). When my end user clicks on the same icon, they receive back a “not privileged to run this report” message. I’m sorry, but GP2010’s security is not all that intuitive when it comes to options outside the usual modules like Payables, Receivables, etc. These smartlist were OK all this while. This only happen on the server but not on other client PC. What should I do? Is GP corrupted and require reinstallation? I tried all the maintenance work at Smartlist builder such as Refresh Cache, Refresh Smartlist and Check Link. Seeing the message has the word “Extender”, I also run all the maintenance work on Extender. But all the above does not help a bit. Any clue why this happen? I have not seen this before, not sure what have caused something like this. Do you know if anything was changed or installed on the server? You could certainly try re-installing GP, or maybe even a repair. If this persists, you may need to talk to GP Support about what’s causing this error. About Extender Notes, yes you are write you cannot create view on those notes through Extender View option. But you can create view through SQLServer. Am I correct that you cannot create an Extender view for Extender notes? This being the case, or other, it appears all details for Extender Notes are housed in the EXT00150 table – please confirm. As Naseer has confirmed, Extender Views will not include the Extender notes, only windows. From what I can tell, you are right – all the notes are in EXT00150. Thanks for this support. It resolved. Thanks for prompt reply, I appreciate that. I did create a view by adding Extender tables into my previously built view. Result is coming up now, but it is showing some garbage charactors where ever the record is null. Why it is like that? How can I remove that garbage? I did the same steps but I could not get the result in verion GP 10. Why? I have a new Smartlist created by using a new Extender View. Smartlist is working fine. But when I add a new Extender window into it, it does not come. Not a single field is appearing. Can you help me in it? I have seen this happen if the Key Fields are not correct. You could also try creating a new Extender View with both the Extender windows and verifying that view still shows data. There might be an easier way to do this if you’re using SmartList Builder. Extender has built in functionality to automatically create a SQL view with the Extender data for you, and it can bring in all the actual list values for you instead of having to do this linking manually. Take a look at my post on creating Extender Views for more detail on this. I went through the steps above, but I’m having a slightly different problem that I’m hoping you can help with. 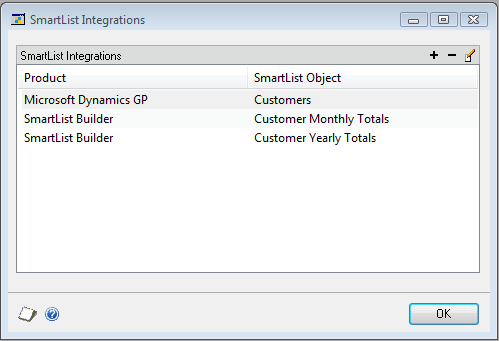 When I use Smartlist Builder, I can access the Extender table and fields that I need. However, there are several data types are being saved in one field (e.g. fabric, path). Field PT_UD_NUMBER saves the value type (3=path, 4=fabric). Field STRGA255 saves the corresponding value. So I need to look-up PT_UD_NUMBER to get my STRGA255 value. Is there a way to complete a look-up in Smartlist Builder. Hi, i´ve read the article, and it help me a lot, but i want to ask you if you have this kind of information, but aplying to GP8. Or if you now where can i find it. Because the menues and configurations are a litle bit different between versions, and a cant find anything in partner source. I have not worked with Extender too much in GP 8.0, but from what I can tell, the functionality should be pretty much the same. Please try it out and let me know if you do find any differences or have any questions on it. 1. Manually delete all the Extender fields from that SmartList (see the last screenshot in my post and the associated instructions), close SmartList. 2. Go back to Extender, delete the SmartList link from the window. 3. Re-add the SmartList to the Extender window. Another reason why there may be an issue is outlined in KB article 914170. If neither of these helps, post back with some more details of which SmartList and what the keys are on your Extender window and we’ll try to troubleshoot further. I appreciated the step by step approach. Everything went well until the time to run the report. All the fields were present, however the data did not come over into the columns. Any thoughts on what may have occurred?